On the surface, the holiday season appears to be one big happy celebration. TV commercials tug at our heartstrings with scenes of three generations gathered around a juicy golden turkey from the local supermarket or smiling friends toasting the occasion with an upscale brand of liquor. Retailers tug on our purse strings with Black Friday sales and Cyber Monday bargains so we can surprise our loved ones with the “perfect” gift. It’s all home and hearth, parties and presents, tinsel and candy canes…or is it? The holidays, especially Christmas, have served as a backdrop for the romantic suspense genre in both film and fiction for decades. While Christmas and criminals seem an unlikely combination, many writers and producers have successfully blended the two to create fast-paced thrillers and mysteries that have you sitting on the edge of Santa’s lap. Think about John McClane, the hero of the movie Die Hard. While in L.A., he manages to rescue his wife when she’s taken hostage during a Christmas office party. In the Home Alone film franchise, the young hero(s), accidently left on his own during the holidays, repeatedly combats bumbling burglars with comic results. Black Christmas, an indie film released in 1974, is about a slasher who terrorizes a sorority house during Christmas break. Authors, too, have tapped into this merry, scary mix of holidays and whodunits: Silent Night by Mary Higgins Clark, Hercule Poirot’s Christmas by Agatha Christie, Hard Christmas by Barbara D’Amato. Two of my romantic suspense stories feature mistletoe and mayhem. I wrote an exclusive holiday wedding scene for Marriage Under Fire, which is featured in Criminal Christmas, a box set of eight holiday suspense stories. Although not part of the original story, adding the winter wedding allows fans to reconnect with all of their favorite characters from the Grayce Walters mystery series amidst the love, romance and fellowship of the season. 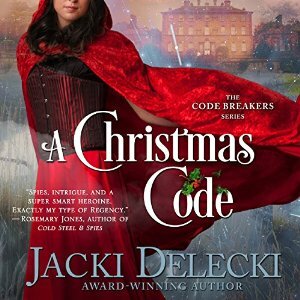 A Christmas Code, book 2 in the Code Breakers series, enabled me to incorporate historical Yuletide traditions, enriching the authenticity of this Regency espionage thriller. For romantic suspense authors, the love, peace, joy and comfort of the holidays offer a sharp and vivid contrast to the terror, danger and peril of mysteries and thrillers. When everything you love most is at risk, it becomes that much more precious when saved by a clever hero and/or heroine. What is your favorite holiday romantic suspense film or book? Comment for a chance to win a digital copy of Criminal Christmas or an audiobook version of A Christmas Code. Jacki Delecki is a bestselling romantic suspense writer. Delecki’s Grayce Walters Series, which chronicles the adventures of a Seattle animal acupuncturist, was an editor’s selection by USA Today. Delecki’s Romantic Regency The Code Breaker Series hit number one on Amazon. Both acclaimed series are available for purchase at http://www.JackiDelecki.com. To learn more about Jacki and her books and to be the first to hear about giveaways join her newsletter found on her website. Follow her on FB—Jacki Delecki; Twitter @jackidelecki. Her latest releases include the audiobook version of A Christmas Code, narrated by Pearl Hewitt, and Criminal Christmas, a set of eight holiday suspense stories for just 99¢. Thank so much JRS for hosting A Christmas Code and A Criminal Christmas! I love holiday reads and romantic suspense books... as for a favorite... the only thing popping into my head at the moment are JD Robb's books... she has a couple In Death books around Christmas time that I read. Thanks for sharing! My favourite Christmas movie is still It's A Wonderful Life with Jimmy Stewart. It just says Christmas to me and I watch it every year. Hi Jo-Anne, I also love A Wonderful Life! Never the holiday season unless you watch! Criminal Christmas was so much fun to put together. I've now read every book and can personally recommend, as well as Jacki Delecki's A Christmas Code!!! Love Pearl's melodic voice. Hi Joan, glad you enjoyed my author friends. Good Luck with the drawing. I don't know that I do have a favorite, but I love Christmas reads. I love Christmas reads too. I have a stack (still read actual books) and pull them out in December. Good Luck with the drawing.